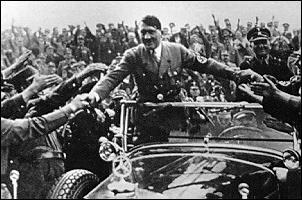 Sep.1, 1939 Hitler's Juggernaut Hitler's juggernaut invaded Poland on Sep1, 1939 and another World War began. The rapidity with which Poland fell to the invaders, largely due to the Luftwaffe, had a stunning effect upon many Americans. What little lethargy remained was shattered in Apr.-Jun. 1940 when Norway, Holland, Belguim, and France fell before the Nazis, leaving the British Isles as the Free World's only bastion in western Europe. During the "Battle of Britain" which took place from Aug. 8, 1940 to the spring of 1941, the Luftwaffe suffered such In but a few months, the words "Stuka" and Blitzkrieg" became commonplace in the English language, feared symbols of supposedly invincible Nazi military strength. 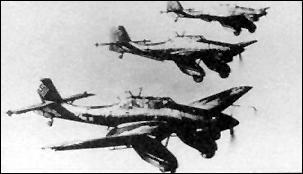 The Luftwaffe then directed its attention across the English Channel and attempted to bomb the British into submission. heavy losses that it finally was forced to call off its concentrated air offensive. Adolf Hitler at the time he came to power in 1933. At this early period many considered him a buffoon, not to be taken seriously. It was not many years before the world realized his full intentions.